You can’t decide between giving her flowers or a piece of jewelry for Valentine’s Day? This gift pack includes both things and is a great choice for a gift for a special woman. Show the woman of your life that she’s the only queen of your heart. A round bouquet with 12 pink roses with some green decoration. Watch with a black strap and a rose gold plated stainless steel face with incrusted crystals, from Folli Follie. Size: 41 mm. *This product has a two-year warranty from the time of purchase. Contact any authorized store that carries the brand to handle concerns covered by the warranty. 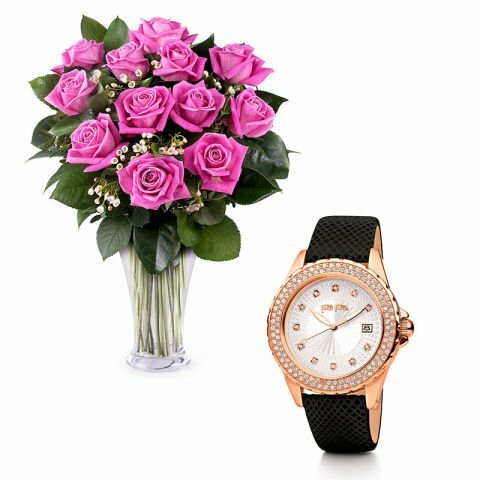 For modern women with no time, a fashionable and luxurious watch full of gleaming crystals and a colorful bouquet of pink roses as a gift for a special occasion.